I find it quite interesting that my most read post of all time with over 31,000 page views is ‘What to wear at home’. Obviously it's not just me who always has this topic on my mind. I love to change my clothing when I get home after work or a day out but I'm sometimes stumped on what the best thing to wear is (yes it's a first world problem). Home loungewear needs to be a peculiar blend of alluring, comfortable and not too delicate. Loungewear is not pyjamas either. I have two sets of man-style pyjamas, one in striped blue cotton and the other a mushroom and cream baroque-print satin. Even though they are 'man-style' in name, I feel very feminine in them. But putting them on straight after work doesn't seem right. I did do this once after a late afternoon shower and when my husband got home from work he thought I was going to bed. This past winter I've worn leggings and a v-neck fine merino top which has been successful - cosy, attractive and, with two sets I always have one outfit to wear while the other is in the wash. In the summer I've worn fine cotton or satin palazzo pants with a complementary t-shirt. 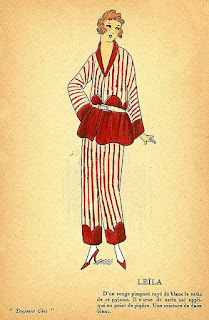 I wouldn't mind getting some even prettier pieces than that though, items that are specifically loungewear. I will be sure to purchase in 'my' colours too - and I can really enjoy using the prettiest and most feminine shades of Soft Summer. I was looking at camisoles today and had my Colour Me Beautiful wallet in my bag which was fun. I didn't buy anything though because none of them were quite right and I'm going to shop more intentionally and resist the instant gratification of taking something home. Since my wardrobe is more pared down than it was, it's quite nice to be sick of wearing something at the end of the season and looking forward to the next season. Please do share your favourite home loungewear ideas. Do you have specific clothing for this or keep your day clothes on? Hi Fiona, I love your blog. I always have to change into comfortable clothes when I get home and trying to find the right balance between comfort and looking nice was a challenge. I was inspired by your original 'what to wear at home' and have been wearing leggings and longish jumpers, which is a big improvement on what I used to wear. The winter is long here in Melbourne - so I thank you for inspiring my better choices for winter clothes for home wear. Last autumn I began to pare down, but upgrade, my wardrobe. Throughout the spring/summer I wore dresses at home(which my husband really loved.) Using an apron while in the kitchen kept them all looking fabulous and I enjoyed feeling feminine. When the cold weather arrives I will probably switch back to my pureJill knit pants by JJill and a soft feminine sweater in "my" colors. BTW I'm a winter. I tried pajamas in the past, and even night shirts, but always felt funny when someone came to the door in the early evenings and I looked ready for bed! Now in cooler weather, I wear leggings (or yoga pants) with a camisole and a comfy cozy sweater. Sometimes it is a wrap sweater, sometimes a v neck, sometimes a cardigan. In warmer months, it's very light (silk or cotton) loose pants and a tee shirt. I feel these combinations are best for me- I can take out the trash or walk the dog and still look fashionable. I can run out for a quick errand without changing. Love this beauty series- such great ideas! 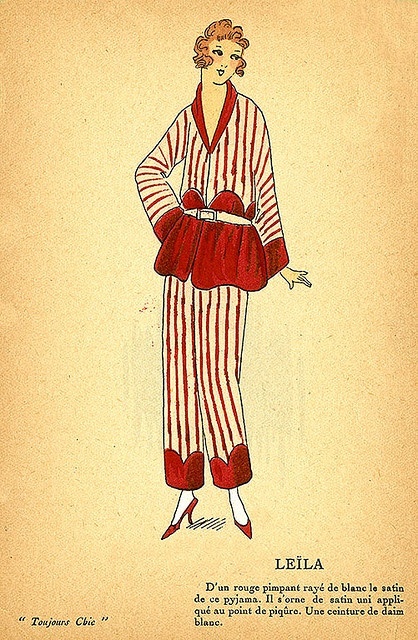 I love the image at the top of your post -- it captures the insouciant chic of good loungewear perfectly. This is a super topic because it's not one people often think much about. It's easy to slide into sloppiness when at home, and that tends to spill over into other areas of life. I haven't yet figured out my solution to comfortable and nice-looking loungewear in the summer and am prone to put on things that are one step away from being consigned to be dust rags. In the winter I like to wear a long cashmere top with comfortable leggings, so am similar to you on that front. And, I too have a beautiful pair of silk pajamas -- in lavender with cream piping. They are so lovely I haven't actually worn them yet because I don't want to wreck them, which is really silly. I'm not sure what to do about it though. It sounds like many of us are on the same page with home loungewear, and I think I will find some pretty dresses for home in the summer - they will be cooler than wearing palazzo pants. Alison, I'm the same - I have a pair of beautiful silk pillowcases which very rarely are on the bed because I don't want to wreck them. Maybe it's the silk thing? Maybe wear them on a night where you retire early to read and relax? Make yourself do it? It's a tough one! i'm with you fiona. pj's too early in the evening doesn't feel right to me either. i wear a super soft pair of yoga pants, not tight at all and a super soft tshirt or tank with a warm sweater in the cold months. in the summer i'll wear a caftan or long, comfy maxi. the key to either of these looks is to wear a soft bra b/c i don't know about you but that's the first thing that comes off when i get home! In summer, I have a nice green caftan that I wear when I get home from work. It's comfy cotton, short sleeved, full enough that I can curl up in it and it has pockets! For winter, I went and bought a few pairs of knit drawstring pants and some cute tees.I also have a couple of old sweaters that are still good to wear over them.. I prefer to change when I get in rather than wear my work clothing to cook in. I have the same problem Alison does with worrying about my silks- though in my case my muddy, slobbery dogs are the real problem! I can tell you that the silk pillow I made from a remmnant survived daily usage and weekly washing in the machine on delicate for seven years till the seams gave out. when it's warmer I prefer Yoga type capri pants with a tank top. I did a marathon of gardening the other day and was so dirty that I had a shower and got right into my pj's...it felt a wee bit odd but I was clean and cozy and ready to head off to bed early after dinner. I will wear yoga pants and a tunic in mild weather, and throw on a poncho when its really cold. Over the summer, I've been wearing casual kimono type dresses (casual cotton with dolman sleeve). Great topic! Really enjoying this series of posts Fiona!